I really should go to the ballet more often. It’s a rare treat, but one that never fails to enchant me. And I wasn’t the only one feeling the love at last night’s UK premiere of Christopher Wheeldon’s Cinderella, performed by the Dutch National Ballet and the Royal Ballet Sinfonia. The story is one we all know well… and yet at the same time, it’s not. Wheeldon took as his inspiration the Brothers Grimm version of the fairy tale rather than the more traditional Charles Perrault story. So there’s no fairy godmother and no glass slippers; instead, Cinderella – a more resilient character than we’re used to seeing – is guided throughout by four male Fates, and her transformation for the ball is provided by a magical tree growing over her mother’s grave and the Spirits of Lightness, Generosity, Mystery and Fluidity. 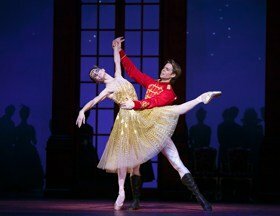 Wheeldon, aiming for a more balanced tale, also provides a little back story for Prince Guillaume, who’s being pressured by his parents to choose a bride, but to their frustration, prefers to have fun with his friend Benjamin – until he meets Cinderella at the ball, and she loses a shoe, and… we all know how the story ends. Anna Tsygankova and Matthew Golding are stunning as Cinderella and her prince; their romance is both magical and totally convincing (not surprising, since they’re a couple in real life, too). Tsygankova is particularly captivating; tiny and delicate, she captures the spirit of the beautiful and kind-hearted Cinderella, refusing to be beaten by her stepmother’s cruelty and her father’s neglect. Meanwhile, Wen Ting Guan and Nadia Yanowsky provide comedy as the stepsisters, clumsily trying to outdo each other in their bid for the prince’s attention. Set to Prokofiev’s 1945 score, the production is a visual feast, thanks to Julian Crouch’s lavish set and costumes. The rainbow effect created by the Spirits who help Cinderella prepare for the ball is gorgeous, and the ball itself is predictably spectacular. But the highlight has to be puppeteer Basil Twist’s stunning horse-drawn carriage, with Cinderella held aloft, her beautiful ball gown billowing behind her. It’s every little girl’s dream come true, and a dramatic and lovely end to Act 1. The story does have some darker elements (like when stepmother Hortensia mutilates her eldest daughter’s foot to try and fit it into the shoe). And not everything is fully explained – Benjamin’s sudden passion for stepsister Clementine, as lovely as it is, does seem to rather come out of nowhere, considering his earlier disdain towards her. On the whole, though, Wheeldon’s Cinderella is an uplifting, sweeping romance with a gently mischievous sense of humour, which will leave you with a smile on your face and a skip in your step. Dutch National Ballet presents a new interpretation of Cinderella, choreographed by Sadler’s Wells Associate Artist Christopher Wheeldon. Premiered at Dutch National Opera & Ballet in December 2012 to great public and critical acclaim, Wheeldon’s ballet is set to Prokofiev’s score – performed live by Royal Ballet Sinfonia – with sets and costumes by British designer Julian Crouch. During the London run, the title role of Cinderella will be performed by Anna Tsygankova. Earlier this year the Russian dancer made her debut with The Royal Ballet as a Guest Artist, dancing Kitri in Don Quixote. She will be joined on stage by her partner, Canadian dancer and Guest Principal Matthew Golding. Having been a Principal since 2010, Golding joined The Royal Ballet in March 2014, but remains as a Guest Principal with the Dutch National Ballet. Roles will be alternated and certain performances.